This October, Playshop Playhouse will be launching its very first original musical, Always Upon A Time. Inspired by Fables and Parables by director and writer, Freddie Santos, Always Upon A Time, is a completely new and original material, equipped with an entirely new script and beautiful new songs. The only remnant of the original material is the main theme song that holds the title, written and arranged by Mr. Freddie Santos and Mr. Lito Villareal, respectively. Tailor-suited for families, the new musical tells the story of siblings, Tommy and Danny, who take their Dad up to the attic to find the book of wonderful stories their Mom used to read to them to sleep. With their impatient Dad who is too busy and too unexcited to participate, the brothers open up the books one story at a time, in the hopes of opening their father’s heart too. Theater Actor- Director Steven Conde wears many hats in this production, as the director, script writer, while his fellow theater actor colleague, music composer and former Ryan Cayabyab singer, Vince Lim, takes the role as the arranger and musical director. Lyrics were composed through the joint forces of Steven, Vince and Joaquin Valdez. 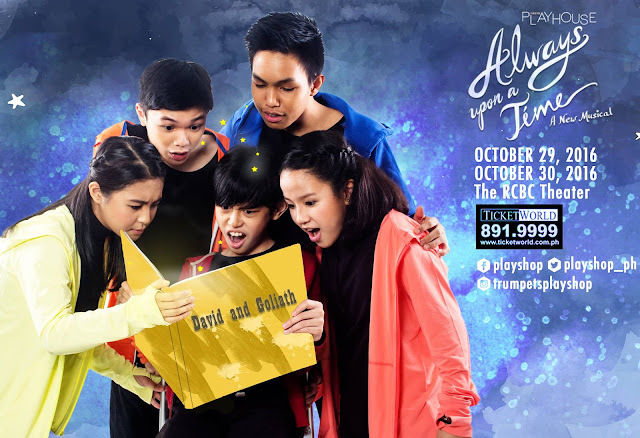 The talented cast includes Andee Achacoso, Daniel Drilon, Gabo Tiongson, Teddy Velasco, alternating on the lead roles as Danny and Tommy. To play the Father is none other that Philippine Theater’s finest, Mr. Lorenz Martinez. On top of this, bringing all the favorite Fables and Bible Stories to life to life is the amazingly talented cast of kids and teens composed of Anton Posadas, Chimmi Kohchet- Chua, Crystal Paras, Daniel Kahn, Eena Salvador, Eggo Velasco, Ethan Paras, Gabby Concepcion, Guido Gatmaytan, Michelle Chua , Rianelle Albaladejo, Reubz Galenzoga, and Vea Salvador. To make the experience even more spectacular, accompanying the cast on-stage are puppets, designed and created by the Make It Happen Workshop. The same team will also take the reign on set and costume design. Trumpets Inc.’s homegrown talents, Joaquin Valdes, also takes the seat as Executive Director of Trumpets Playshop and Youth Projects; while Kathleen Francisco, handles Marketing and PR. Both are joined by Lani Ligot, Char Suarez, Marketing and Sales; Ria Ortega, Company Manager; Josephus Gayona, Production Manager; Michan Mendoza, Stage Manager and Leoren Violan, Graphic Artist. Get ready to be immersed in the magical world of our favorite storybooks!